Originally built for Edward the Confessor more than 1,000 years ago, the Houses of Parliament, or Palace of Westminster, remained the principal residence of Britain's monarchs for the next 400 years. Thereafter, it became the administrative centre of the country. In 1834 the Great Fire burnt everything except Westminster Hall, and the present Gothic building was completed in the 1840s. It is perhaps most famous for the clock tower, commonly called Big Ben. Located at the north end of the Palace of Westminster in London, the gigantic clock tower has many distinctions: it is the largest four-faced clock, and third-largest freestanding clock in the world. Built in 1859, each minute hand is 14 feet (4.3m) long, and the largest bell inside weighs more than 13 tons. Although Parliament is closed to visitors during session, it is still a popular attraction for tourists because of its picturesque exterior. 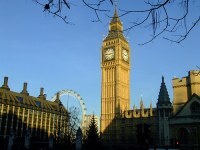 While Big Ben itself is not open to overseas visitors, UK residents may arrange tours with a local Member of Parliament. Be warned, though, inside the clock tower there are 334 stairs and no lift. Check the website to see what tours of parliament are available and when.